Video Amusement rents only the best! 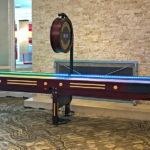 The Champion Shuffleboard tables for rent are the best tables on the market. All American made with highest quality standards. 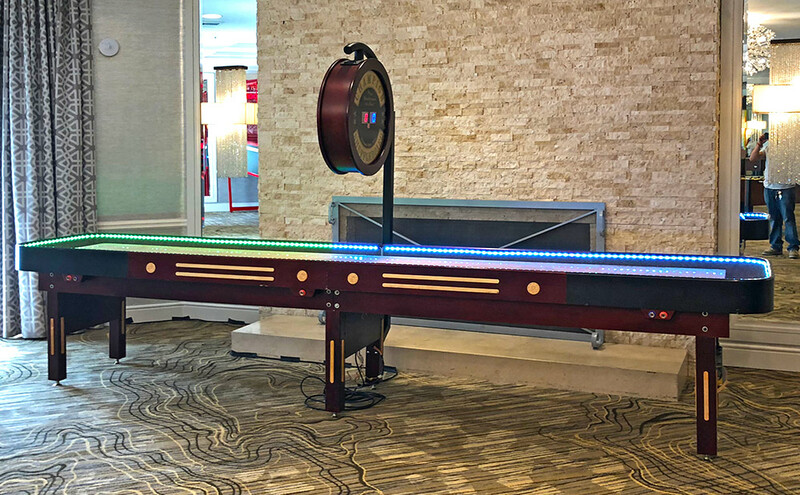 The LED Lighted Shuffleboard Arcade Game tables come made with playfield that is extremely slippery. The play field is made out of 3-inch maple wood butcher block with a smooth polymer surface and covered with silicone wax. 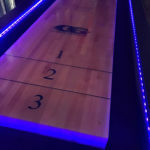 All tables come with oversized 24-inch handcrafted cherry wood electronic scoring unit and genuine shuffleboard weights or some call it pucks. We offer two sizes of shuffleboard tables, 14 foot and 22 foot. Original shuffleboard playfields used to come as one solid piece. You can imagine how difficult it used to be to move 22 foot playfield. It took 6 men to lift the solid maple butcher block. Getting such a large piece of equipment into a location was another challenge! Today the playfieds come split in half what makes them easier to move. However both halves have to be precisely lined up during installation. Shuffleboard is a traditional bar game. When placed in a darker venues due to the long size of the game the game becomes difficult to play. 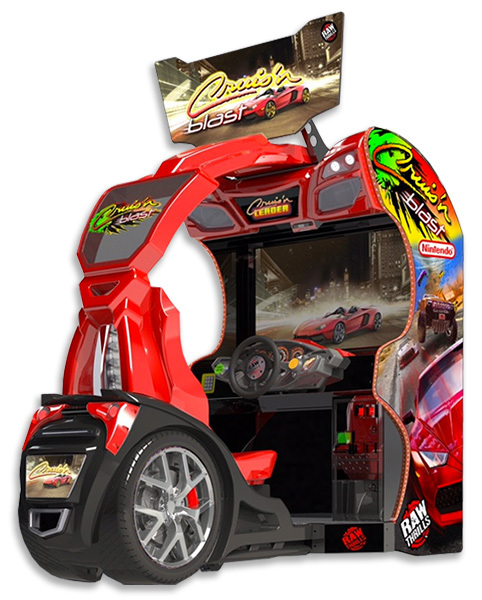 Our creative team at Video Amusement came up with a solution. 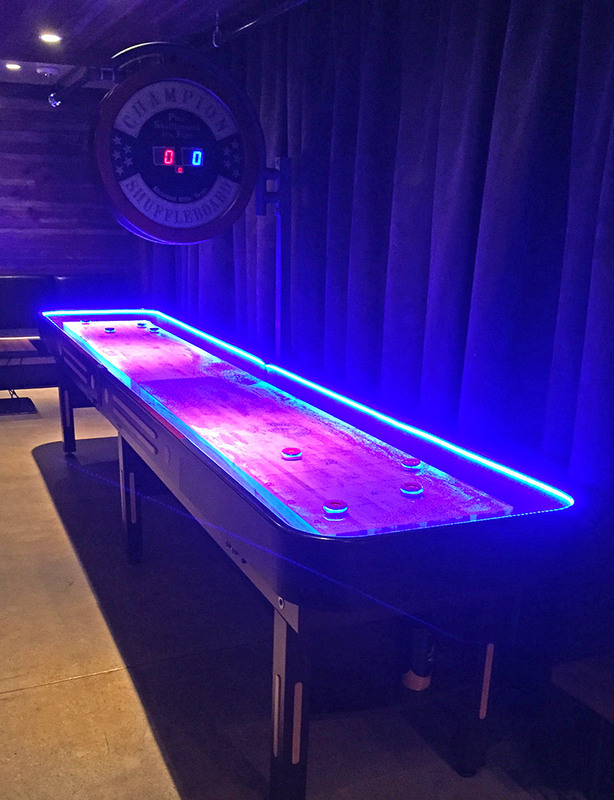 We added two multi-colored RGB LED strips on the inside perimeter of the game and LED Lighted Shuffleboard Arcade Game for rent was born! 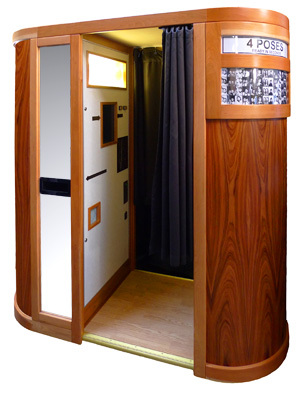 LED Lighted Shuffleboard Arcade Game rental can be played during daytime or even better during nighttime. 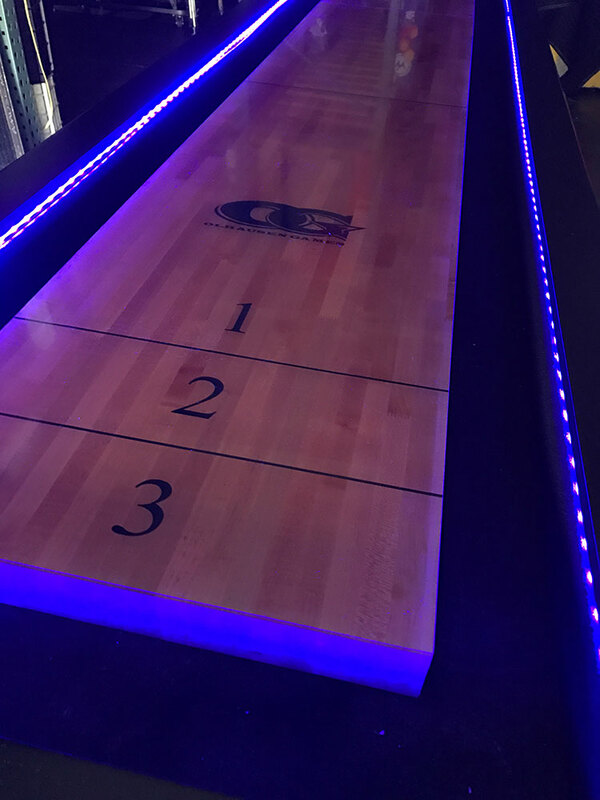 The RGB LED lights are bright and the rented LED Lighted Shuffleboard Arcade Game can be even played in total darkness. RGB LED Lights are fully adjustable for brightness and color to balance the mood of your event and captivate the crowd. LED Lighted Shuffleboard Arcade Game customization is limited to pucks, scoring unit and possibly front of the table. Shuffleboard itself is a beautiful cheery wood cabined with nice trims that stands out on its own.